This is the world's second and Asia's first arch dam, constructed across the Kuravan and Kurathi hills. 550 ft. high and 650 ft. wide, the dam lies close to the Cheruthoni barrage. To its west is the Kulamavu Dam. 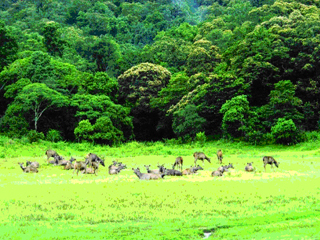 Idukki Wildlife Sanctuary is located closeby. Nadukani is an ideal place for one-day picnickers. True to its title it offers a panoramic view of a large area than one can experience from any high mountain park. A two-storyed pavilion makes an ideal place for enjoying the landscape and beauty of nature. This is a picnic spot also ideal for meditation, relaxation and watching sunset. Kulamav (20 km): Dam site, trekking trail, view point. 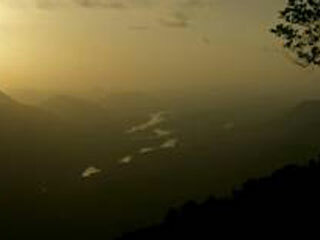 Painav: Scenic beauty, trekking point, evergreen forest. 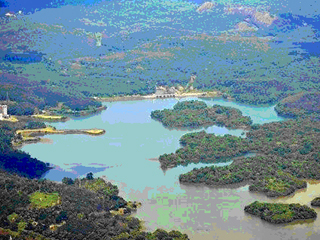 Cheruthoni: Idukki Arch Dam sight, aerial view of the reservoir, panoramic view, hill view park. Kalliyanathandu (10 km from Idukki): The aerial view of the Idukki reservoir, panoramic view of peaks and forests make this a splendid tourist spot. It is also an ideal place for mountain climbers and trekkers. Lying close to the plantations, in the rich jungles of Periyar in Thekkady is one of the world's most fascinating natural wildlife reserves - the Periyar Wildlife Sanctuary. Spread across 777 sq. km, of which 360 sq. 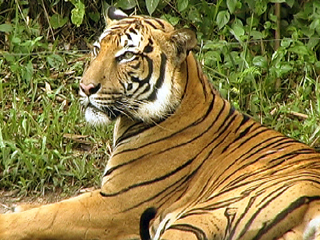 km is thick evergreen forest, the Periyar Wildlife Sanctuary was declared a Tiger Reserve in 1978. Noted for its geomorphology, diversity of wildlife and scenic beauty, the Reserve attracts visitors from all over the world. The splendid artificial lake formed by the Mullaperiyar Dam across the Periyar River adds to the charm of the park. This is the only sanctuary in India where you can have the unique experience of viewing wildlife at close quarters from the safety of a boat on the lake. 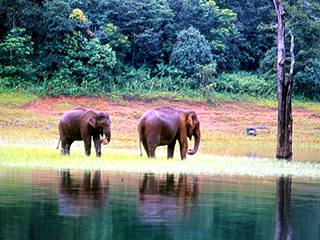 The greatest attraction of Periyar, however, is the herds of wild elephants that come down to play in the lake. Entry to the Periyar Wildlife Sanctuary: 0600 - 1800 hrs. Flora: Over 1965 flowering plants including 171 grass species, 143 species of orchids, the only South Indian conifer Podocarpus Wallichianus. Mammals: Thirty five species including the wild elephant, gaur, sambar deer and wild boar which can be sighted from the boats the Nilgiri Tahr in the higher rocky areas the endangered lion-tailed macaque confined to the evergreen interiors the bonnet macaque, Malabar giant squirrel, flying squirrel, tiger, jungle cat, sloth bear etc. 265 species including migrants. The hornbill, stork, woodpecker, kingfisher, raptor, cormorant, grackle, darter etc. Cobra, viper, krait, a number of non-poisonous snakes, and the monitor lizard. Frogs, toads and limbless caecilians include the colourful Malabar gliding frog, common Indian toad, fungoid frog and bicoloured frog. The Periyar lake and streams have several species of fish including the masheer, the famous and endangered game fish of India. The otter, the only mammal of the lake, can be frequently spotted from the boat. 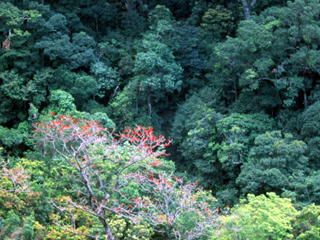 Tea, cardamom, pepper and coffee plantations surround the Periyar Wildlife Sanctuary. The Wildlife Preservation Officer, Periyar Tiger Reserve, Thekkady. Village Tour - on bullock cart Rs. 500/- per person. The River Periyar flowing through the centre of this town nourishes its vast tea, coffee and pepper plantations. A major trade centre, Vandiperiyar is also home to a number of tea factories. The Government Agriculture Farm and Flower Garden have a delightful array of rose plants, orchids and anthuria. Plantation tours are arranged from the District Tourism Information Office at Thekkady Jn. in Kumily. Tours cover cardamom, pepper, coffee and tea plantations, tea factories, tribal settlements and the surrounding hill regions. Ph: 222620. 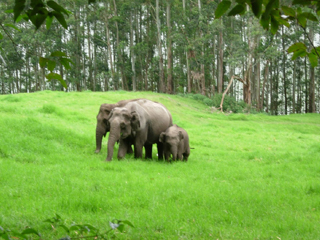 Elephant rides: The Forest Department, Thekkady offers facilities for elephant rides through the jungle. Time: 1000 to 1700 hrs. Duration of a trip: 30 minutes. Fare: Rs. 30 per person. Tickets are available from the Wildlife Information Counter. Ph: 222028. Ottakathalamedu: 5 km from Kumily Grampi near Vandiperiyar. The Forest Department conducts daily treks from the boat landing station at Thekkady to the Nellikkampetty area and Manakkavala. Starting: 0700 hrs. Fare Rs. 250 +10/- entrance fee. Bookings can be made with the Wildlife Preservation Officer, Thekkady. Ph: 222027 222028. 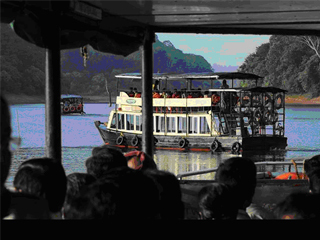 Boat cruises on the Periyar Lake: 0700, 0930, 1130, 1400, 1600 hrs. Fare: Lower deck: Rs. 25 + 10 (entrance fee), Upper deck: Rs. 50 + 10 (entrance fee). 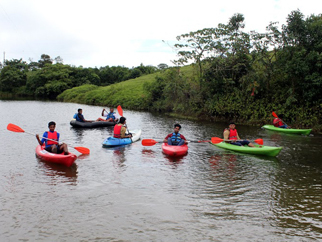 The Forest Department (Ph: 222028) and the Kerala Tourism Development Corporation Ltd. (contact 222023) conduct boating trips from Thekkady. Fare: Lower deck: Rs. 50, Upper deck: Rs. 100. The Forest Department (Ph: 222028) and Kerala Tourism Development Corporation Ltd. (Ph: 222023) conduct boating trips from Thekkady. Peermede and surrounding areas are ideal for trekking, cycling and horse riding. Trekking sites: Peeru Hills, Kalthotti, Vagamon, Karandakapara Hills, Grampi (Parunthupara), Memala Plantation visits: Tea, coffee, cardamom, rubber etc. 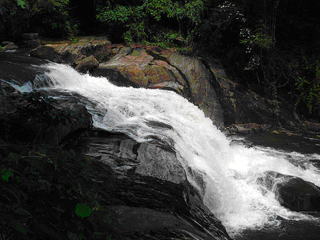 Trips to Meloram, Nallathanni, Panchalimedu, Valanjamkanam Waterfalls etc. Visits to tea factories in and around Peermede. A place for adventure tourism and trekking, or even a langourous, tranquil break. This picturesque plantation town washed in the fragrance of cardamom is surrounded by lush, green hills. The rolling hills, the lovely landscape and the gentle breeze make this an ideal spot for long walks. The hills offer a breathtaking view of the sunrise and sunset. 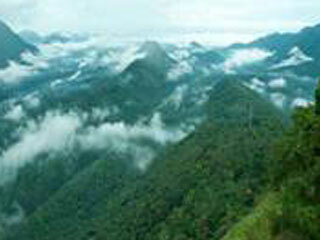 Grampi is also known as Parunthupara (eagle rock) because of the panoramic view from its high peaks. Rocky plains, lush hillsides, forests, trekking trails and picturesque views lend charm to this destination. The road to Grampi is flanked by unending stretches of cardamom, tea and coffee plantations. A hillock that gives a fascinating view of the Peermede mountain range. Lofty peaks, little streams and ever expanding tea plantations are the attractions of this place. Pattumala (which literally means hill draped in silk) is home to the two most famous tea plantations - Harrisons Malayalam and AV Thomas & Co. The Velamkanni Matha Church, built entirely of granite, at the top of the hill is a famous pilgrim centre. The flower garden nearby is a fascinating riot of colours, of roses, orchids and anthurium. For permission to visit the herb garden, contact the Director - Peermede Development Society, Peermede, Idukki. Phone: 232097/232247 Fax: 232096. 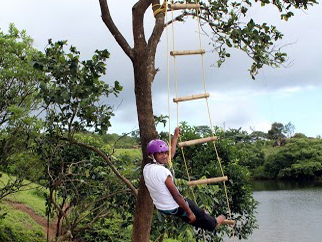 The activites in zone favors adventure tourism. The attractions in this area are elevated Kayaking, Burma bridge, Rafting, Russian chain ladder Zip Liner The Nature trail winding through various areas of the zone attracts a large Number of nature Tourists. This is another picnic spot located in the midst of beautiful hillocks near Kanjar. 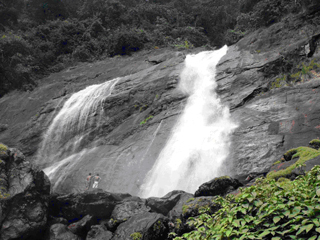 It is easily accessible from Palai in Kottayam district. Surrounded by three enchanting hillocks - Mankunnu, Kodayathoormal and Thonippara - makes this place ideal for trekking. Situated at a height of 1700 m, Mattupetty is known for its highly specialised dairy farm - the Indo Swiss Livestock Project. Over a 100 varieties of high yielding cattle are reared here. Visitors are allowed into 3 of the 11 cattle sheds at the farm. Visiting time: 0900 - 1100 hrs and 1400 - 1530 hrs. Rate Rs. 5 per head. This is the natural habitat of the Nilgiri Tahr. Half the world population of the rare mountain goat (Hemitragas hylocres), which is fast becoming extinct, is now found here. 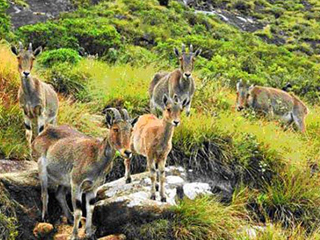 The Nilgiri Tahrs are today reduced to small herds found in the Eravikulam Rajamala region. The total number of Nilgiri Tahrs in Rajamala is estimated at 1317. The 97 sq. km. park is situated in the Devikulam taluk and is home to the Nilgiri Tahr. The Anamudi peak (2695 m) is located in the southern region of the park. Visiting time: 0800 - 1700 hrs. Visitors are not allowed during the monsoon. This waterfall on the way to Thekkady from Munnar cascades down a steep rock 2000 m above sea level. The spot is enriched with the scenic western mountain ranges, and is an ideal place for a break on the way to the Periyar Wildlife Sanctuary in Thekkady. It's a lush green carpet of tea plants. 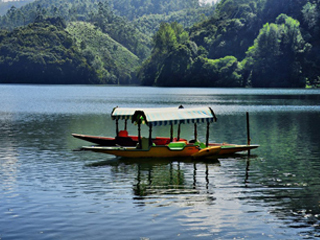 A trip on the splendid reservoir is an unforgettable experience. 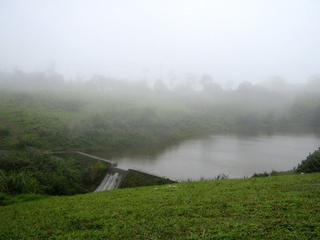 The Anayirankal Dam is surrounded by the Tata Tea Plantation and evergreen forests. It is an ideal picnic spot. 1700 m above sea level; this is the highest point on the Munnar- Kodaikanal road. The rare Neelakurunji (Strobilanthus) belongs to this region. This plant blooms once every twelve years bathing the hillsides in bright blue. 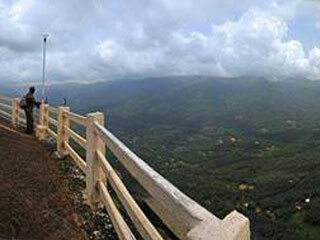 Top Station also offers a panoramic view of the neighbouring state of Tamil Nadu. 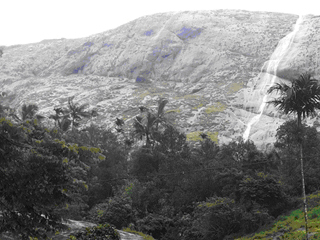 The Cheeyappara and Valara waterfalls are located between Neriamangalam and Adimali on the Kochi - Madurai highway. 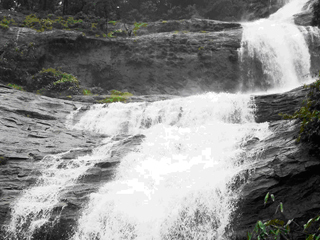 The Cheeyappara waterfalls cascade down in seven steps. It is a real feast for the eyes. This is also a great place for trekking. Meenuli: It is noted for two acres of evergreen forests upon a huge rock. The rock is more than 500 acres in area and an ideal spot for mountaineering. Located on the Thodupuzha - Moolamattam road, this artificial lake is accessible by road. The reservoir is ideal for boating and fishing. The seven step waterfall here is a much loved picnic spot. At each step there is a cascade and a pool beneath. 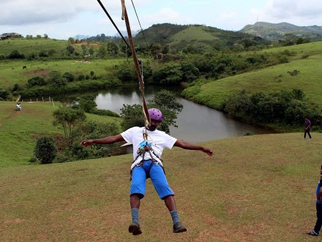 Thommankuthu is an ideal place for adventure tourism. Other attractions: Pedal boating, forest trekking, camping, bathing in the waterfall. The Rainbow waterfalls which cascade down a rock from a height of about 1500 mt is a wonderful attraction of this spot. It can be seen throughout the year in full swing. The forest around this spot is home to various medicinal plants. It is an ideal place for rock climbing, mountaineering and camp trekking. Kochi, Alappuzha and other nearby towns can be seen from this peak which is located 3125 m above sea level. 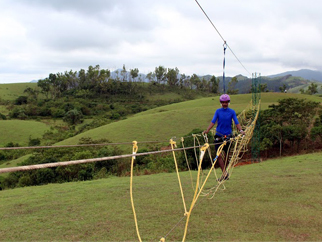 Rolling green hills and the fresh mountain air make Ramakalmedu an enchanting retreat. 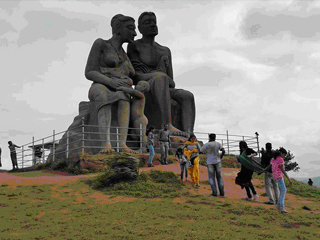 The hilltop also offers a panoramic view of the picturesque villages of Bodi and Cumbum on the eastern slope of the Western Ghats. 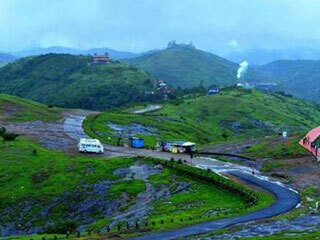 Distance 45 km from Idukki, 40 km from Thekkady and 75 km from Munnar. Bus timings: 0930 hrs Munnar, 1030 hrs Kottayam, 0930 hrs Ernakulam. Situated on the Tamil Nadu border, the Chinnar Wildlife Sanctuary is spread across 90.44 sq. km. 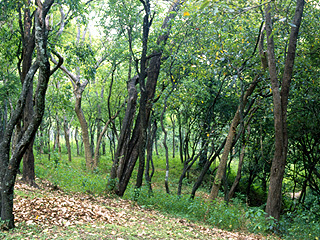 Animals: Most of the South Indian wild animals can be found in this forest. These include the grizzled giant squirrel, champal squirrel, elephant, sambar deer, gaur etc. Birds: Jungle fowl, myna, laughing thrush, black bulbul, peafowl etc. Munnar - Udumalpetta Road: 60 km Coimbatore - Udumalpetta - Chinnar Road: 100 km Kochi - Chinnar: 190 km Prambikulam via Pollachi - Chinnar Pollachi - Chinnar via Udumalpetta: 60 km Kottayam - Chinnar: 208 km. Visiting time: 0700 - 1800 hrs. Entry passes are available at the office of the ACF or the Check Post Information Counter. Charmingly colonial in style, this clubhouse built of wicker and teak still serves as a social centre for the far-flung farmers of the region around Munnar. The club houses an elegant lounge and dining room, the obligatory gentlemen's bar, a billiards room, a library etc. Entry is limited to members only.